Now available through ingramspark, indiebooks, amazon, apple ibooks, and your local indie bookstore. but lo, these 20 years she's managed to produce about one a year. 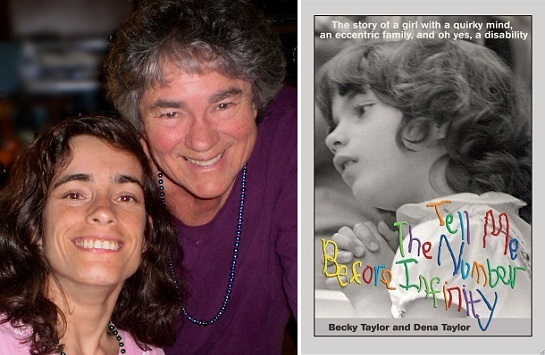 "Tell Me the Number before Infinity" by Becky Taylor and Dena Taylor is the twentieth book. for all your printing, publishing and book authoring needs are available. Kate began as a printer 35 years ago in 1981, working and developing her offset printing skills in many printshops, while learning the letterpress on her own. In 1993, she formed her own business, Many Names Press, as a commercial printery and a print studio. She printed and published her first fine press editions (including "Sam Hergo, Circus Strongman" by her uncle, Bill Stipe, in 1996,) and designing trade editions using Photoshop, Illustrator and QuarkXpress. The press evolved with the times, so she became a graphic designer and sends digital files to book printers instead of printing them herself. She last printed an offset press book in 1999, and gave up the large format letterpresses (wishes she kept the Asbern and Vandercook!) She still prints letterpress using lead type on a eighteen-sixties Craftsman platen pilot press found in an abandoned gold rush town in Oregon. Many Names Press provides experienced writers, poets and artists with services big name publishers and self-publishing businesses will not. With special emphasis on feminist, historical, social, economic and environmental art, the press produces limited edition letterpress books, chapbooks and broadsides of fine art and poetry as well. The press believes in collaborating with her authors about content, look relevance, quantity, marketing, publicity, booksignings and other aspects. This effort of the press, and the authors' full participation, guarantee its success once the book is printed. Publishing a book or two a year by accepting work with complete galleys and credible marketing plans by way of mouth, through friends, acquaintances and fellow poets, Kate wholeheartedly maintain support for her authors and indie booksellers by actively engage in local commerce and culture, and by working with locals (and some women friends and poets like the amazing Louise Grassi Whitney of Napa who wrote “Wet Welded Together"), and as Becky Taylor says, who lives directly above Bookshop Santa Cruz, “can’t get more local than that! and support, nurture & protect this world's fragile ecology for all beings. Many Names Press does not solicit manuscripts, we are too small a press to read all of them. with start-up project funding and a good marketing plan for your project.